There’s been a lot of news and information about quality reporting under MACRA buzzing through medical practices recently, but questions still remain from hospital-based physicians on where they fit into this whole initiative like: What exactly do they need to know about this program, and what does it mean for their employment and compensation? This is inside Medicare’s New Payment System on ReachMD, and I’m Dr. Matt Birnholz. Joining me to answer these and other physician FAQs on hospital practice impacts is Carol Vargo, Director of Physician Practice Sustainability at the AMA. Miss Vargo, welcome to the program. Hello, Matt. Thank you for having me on the program today. Thanks for joining us. So, to start, maybe we can put the big picture question out there first. Do hospital employees even need to care about MACRA, let alone their place in it? Yes, they do, and here’s why. 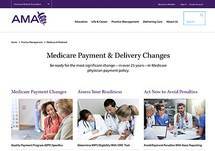 The reimbursement their employer, the hospital, receives in the future for professional services they deliver will be adjusted based on their performance under the new Medicare Quality Payment Program enacted by MACRA, also known as the QPP, so it is reasonable for a physician to anticipate that this will impact their compensation. They should not assume that becoming a hospital employee will not change the QPP’s potential to impact their employment agreement and compensation. The most important message here is that physicians that are employed by a hospital should be engaged with the hospital and the physician leadership and understand the impact. 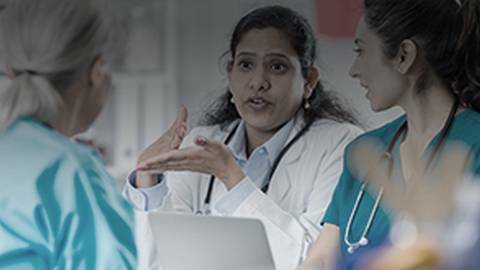 The AMA is committed to informing physicians’ decisions around the QPP regardless of their practice setting. We have developed numerous free resources on the QPP, including one for hospital-employed physicians about which we are focusing on today. Great. And let’s just clear this up. How would the Quality Payment Program, or QPP, affect the collections that these hospitals receive for their services? Well, it depends. The QPP may impact the amount of money received by employers for professional services. That amount will depend on whether employees are evaluated based on performance under the MIPS program or an Advanced APM and actual performance on a number of other variables. For most clinicians, performance under MIPS in 2018 can result in a positive or negative adjustment of up to 5% to the reimbursement that they will receive in 2020. Likewise, if a clinician furnishes services through an Advanced APM in 2018, a 5% APM incentive bonus that’s based on the clinician’s Medicare professional services in 2019 will be paid in 2020. These and potentially other variables can impact what an employer receives for a hospital employee’s professional services under the QPP. So, why don’t we compare how MIPS in particular is applied in a hospital setting versus a private practice setting? Can you help break that down for us? Yes, absolutely. Generally, there are no differences between those 2 settings. The core rules and requirements under MIPS are the same regardless of practice setting. What is different is which entity is managing all of these requirements. In most hospital employment arrangements, the physicians and other eligible clinicians will have fewer choices as well as less individual say in decision-making authority regarding the key MIPS-related decisions. This could include selecting whether to report as an individual or as a group, what EHR technology to use and what important improvement activities will garner corporate support. For this reason, the measure of the MIPS score associated with EHR reporting is weighted differently for clinicians employed by a hospital. However, the other key areas of MIPS are applied uniformly to clinicians regardless of their employment status. Now, given that this entails having less individual say, we know that some hospital-based physicians aren’t going to take MACRA as seriously or just maybe defer decision-making elsewhere, so in that case how can physicians make sure that they are being evaluated fairly? That is a great question. Protecting yourself may be difficult if the hospital has already made participation decisions for you. Ideally, these decisions are going to be made jointly with physicians. There are a few scenarios that a physician can pursue. 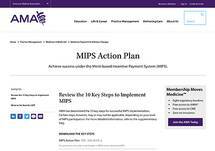 MIPS allows clinicians to report individually or as a member of a group or a facility, and you may be able to advocate for individual reporting under MIPS, as that will permit your performance to be measured separately from that of your colleagues. Be prepared, however, to hear that the hospital wants your performance “in the overall pool” to contribute to the overall score. Another scenario is that a group of specialists could agree to participate in an Advanced APM model that focuses on episodes relevant to their specialty. Depending on the legal structure of the participating physician’s employment relationship with the hospital, they might want to seek a new legal structure as a means to have some autonomy and control over their performance. Given how difficult it can be to reverse decisions made by an employer, knowing what participation track they have chosen should be part of one’s pre-employment and yearly due diligence. So I guess a natural next question here would be whether there are any upsides or opportunities offered by a hospital employment relationship compared to private practice. For instance, I’m thinking even if you don’t have individual decision-making authority, can it be easier to succeed as a group? It may be easier, but whether it is depends on the circumstances, really. Hospitals and health systems often provide significant resources to support practice migration to value-based care. This could include providing certified electronic health record technology. And they also have the ability to invest in new approaches to delivering care and to supporting participation in Advanced APMs. These resources may permit physicians and other eligible clinicians to succeed under MIPS and to participate in APMs at a lower, direct, near-term financial cost. But really, all of this depends on the individual hospital and physician, thus the need to know as much as you can about your options and circumstances. For those who are just tuning in, this is Inside Medicare’s New Payment System on ReachMD. I’m Dr. Matt Birnholz, and with me to discuss everything hospital-based physicians need to know about the Quality Payment Program is Carol Vargo, Director of Physician Practice Sustainability at the AMA. So, Carol, let’s take a look at how this will affect compensation for these physicians in particular. What types of performance-based changes can they expect here? Well, the exact changes, if any, will likely depend again on how they are currently compensated under their employment relationship. Many employers, from hospitals to physician groups and others, will often seek to ensure physicians are individually accountable for their performance by requiring individual reporting under MIPS and by coupling that with adjustments to the physicians’ employment compensation. For example, in compensation models based on individual production measured by work RVUs, the employer might make the dollar amount that employees are paid per RVU contingent upon MIPS or other performance variables. The hospital may propose other changes to the existing compensation structure as federal and other payment programs evolve. Now, with these changes, how can physicians be sure that their compensation is accurate? That’s a really important question. At a minimum, employed physicians should understand how their compensation is currently determined and have confidence that the data used and the methodology applied are accurate and can be validated. This means, for example, that one should be able to track and understand any adjustments to compensation linked to MIPS. Physicians should receive meaningful reports and feedback that help them understand their performance on important variables, including those that may impact their compensation. It’s really in their own best interest and, frankly, in the best interest of the hospital as well to ensure that physicians are able to optimize their performance under MIPS and in any APM in which they participate. And how do MIPS payment adjustments impact physicians’ compensation, if at all? Again, a lot of variables and dependencies, but it’s complicated. So, yes, it depends on the terms of employment and compensation agreement. To the extent that a physician is paid a flat dollar amount per RVU through a base salary or a similar arrangement, there may be no direct correlation between a positive or negative MIPS payment adjustment in their compensation. Conversely, to the extent that their compensation agreement takes into account the revenue collected for their professional services—for example, methods such as a percentage of collections, revenue minus expense, or virtual private practice methods—then MIPS payment adjustments may have a more direct impact on their compensation. Given all these variables, it is just critical that physicians are aware of and understand these methodologies as they relate to their own unique situation. I would encourage physicians to seek out information such as that offered by the AMA, and when able, engage with the hospital. As always, being informed is key to the most successful and productive relationship. Well, I think we’ve just about covered the gamut on how physicians and hospitals can better understand and navigate the Quality Payment Program. Miss Vargo, great to have you with us, and thanks for your time today. Thank you so much, Matt, and thank you for the opportunity to discuss this with physicians and your audience. To access this interview and other related content with the AMA, visit ReachMD.com/AMA. I’m Dr. Matt Birnholz as always inviting you to Be Part of the Knowledge. Are you a hospital-based physician wondering how MIPS will impact your practice? We've got the answers to some of your biggest FAQs. Amid all the changes to quality reporting under MIPS, many hospital-based physicians are unsure about what effects, if any, there will be to their employment and compensation. Luckily, there are experts to help break down everything from performance-based changes to compensation accuracy, and providing a how-to guide for navigating the Quality Payment Program in the hospital setting is Carol Vargo, Director of Physician Practice Sustainability at the AMA.